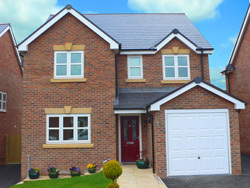 Window Warm’s composite doors are a new revolution in door technology. Made with beautiful proportions and symmetry. Crafted with attention to detail, our doors combine the benefits of a modern pvcu material door with the feel and aesthetic appeal of a traditional timber door. 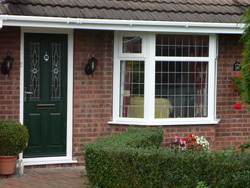 All of Window Warm’s doors offer outstanding energy saving performance, added safety and security for peace of mind, exceptional weather proofing and are low maintenance. Window Warm’s doors will enhance the appearance and character of any home-period, or contemporary, town or country which discerning homeowners will truly adore. Window Warm’s door is the thickest on the market today at 68mm. 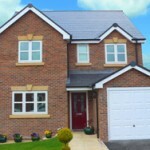 In fact 30% thicker than traditional timber doors. Which makes ours not only much stronger, but also gives a superior thermal performance and enhanced acoustic performance. It makes ours more energy efficient, saving you on heating bills. This is made possible by using a high-density polyurethane foam which forms a solid composite construction to fill the assembly, adding to an almost impenetrable door. Unlike other doors, there is no timber involved, which means no twisting or warping of the door itself. 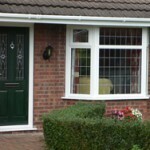 Instead, environmentally friendly pvcu sections with dedicated full steel reinforcement substrates are used for the door skins to be applied to. 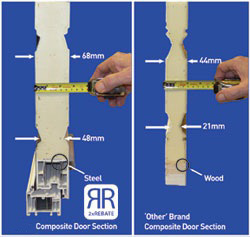 This results in a door which is high impact resistant and tested to the most stringent security standards. Our ‘double rebate’ feature means that we have an enhanced weather sealed performance compared to normal single rebated doors.